If there is a polar opposite country to Thailand, it might just be Switzerland. Our first 5 minutes on the streets of Zurich were culture shock to say the least. It was best exemplified when we tried to cross the street the first time. We stood at a crosswalk on a relatively calm street when a Mercedes came speeding our way. We patiently waited for it to pass and were taken aback when the car abruptly stopped and waited for us to cross the crosswalk. 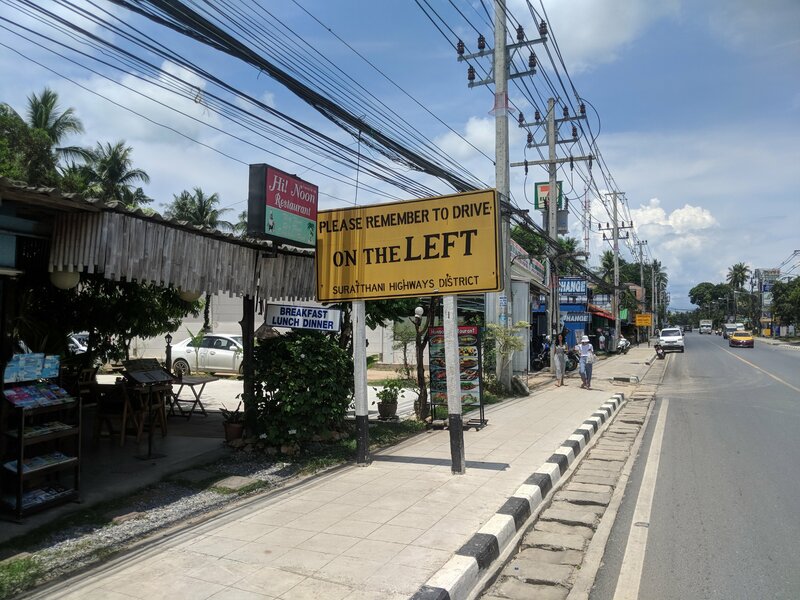 Coming from nearly 6 months in Thailand, where crossing the street is up there on the danger meter with skydiving or the luge, we realized we were no longer in the land with no rules. It might seem a bit strange that we decided to leave Thailand after the last post, as we were so happy. The circumstances for this trip were special though. Lauren’s family had planned a trip to Switzerland for vacation for their first trip outside the US. We agreed to meet them and decided since we were flying that far, we might as well get our plane ticket’s worth and stay in Europe for a few months. We left Koh Tao kicking and screaming albeit excited to see family. We had a wonderful sendoff and are looking forward to going back to the island in the fall. The turnout at Goodtime for our impromptu going away sunset was humbling as all of our friends gathered to send us off. We grabbed some dinner and then hit up the Beer Mason’s for some craft brews with those still standing. We said our goodbyes and woke up the next day to catch our ferry to Koh Samui. Koh Tao means “Turtle Island” and describes not just the sea life, but also the pace of life for the people on land. After being used to this slow pace of a 13 sq. km island for so long, Koh Samui traffic was a circus! We rode the bikes from the pier to the hotel near the airport and then the scavenger hunt began. 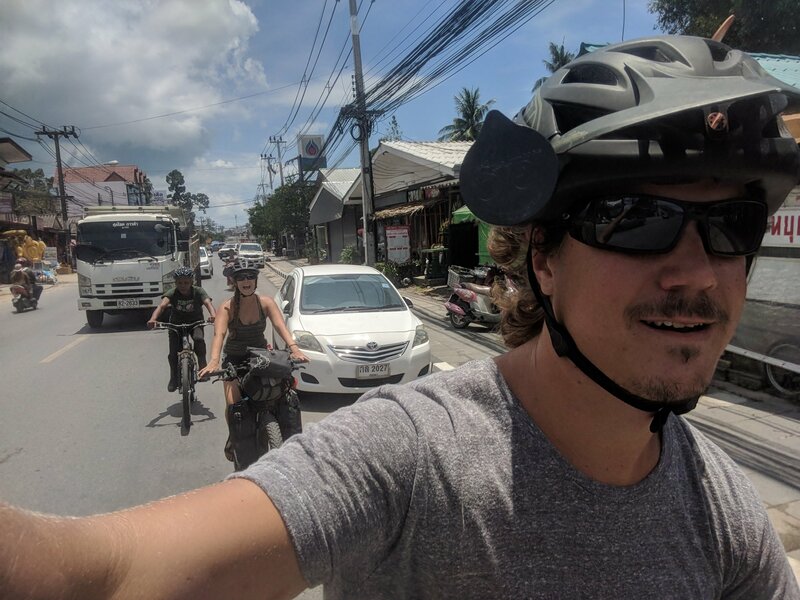 The packing tape had been no problem, but three bicycle sized cardboard boxes and bubble wrap were not easy things to track down at 3:30 on a Friday afternoon in Koh Samui! We rented a scooter and spent two days rounding up the necessary supplies. The island itself was a tourist trap to say the least so we were not sad to leave. We had trouble at the airport terminal when Lauren’s name was paged and we had to hitch a ride to the baggage terminal because you can not fly with power bank batteries in your checked luggage. We politely fished them out of our bags. As I plucked the third one out, I caught a glimpse of our fuel canister which most definitely was still at least half full of gasoline. It made it through security with no problem! The flight to Bangkok was pleasant with fish and rice for breakfast on the plane. We transferred to Swiss air in Bangkok and had a lovely flight to Zurich. We finally watched “The Last Jedi”, relaxed and slept. As we flew over a part of the world full of so much turmoil, I couldn’t help but think about how good it felt to be on our way to see family and explore this amazing planet some more. Which brings us back to Zurich. We landed and took a 30 minute cab from the airport to our hotel for the cost of 3 days living expenses in Thailand. Lauren cooked a delicious pork chop dinner, we assembled the bikes and set off on our journey into the alps. The first day was gorgeous. We got out of town and into the hills and were treated to beautiful deciduous trees, lovely weather and secluded roads. We pulled off on a path and set up our tent for a great night’s sleep. The next day we awoke to freezing cold rain and snails everywhere along with the realization that we were not prepared for May in Switzerland. We literally had no pants! We froze our asses off the next day wet and cold and had a challenging day of constant climbs with little respite. At the end of the day, we were exhausted and had to resort to getting a hotel despite it being way out of our budget because we were soaked to the bone. The next day we found a thrift store, bought some pants and more appropriate cold weather gear and continued on our way. Unfortunately the weather didn’t improve much for the next week and a half, but we made the best of it. Switzerland is without a doubt one of the most beautiful places in the world. The scenery is spectacular. After the second day, we literally ran out of adjectives to describe our surroundings. Also, it is one of the most bicycle friendly places we’ve ever seen. Everyone rides bicycles so the tiny cars are very courteous to cyclists. As we progressed, I kept joking that Switzerland was the land of rules… and for some unknown reason, everyone there actually follows them… All of them! One of my big issues in the military was having to follow rules that I deemed stupid so this obviously presented a slight problem for me. I coped with little rebellions like jumping curbs and blasting through roundabouts the wrong way when no one was around just to make myself feel better. I was constantly humming “Signs” by Tesla because there were signs everywhere telling you what to do. Fortunately or unfortunately we couldn’t read them. Also, the people didn’t seem quite as welcoming to visitors as we had hoped. We ran into more than a few servers who scoffed when they found out we didn’t speak Swiss German. We learned basic phrases but it was not enough to please some people. Some signs made us happy! On the other hand, we met some fabulous individuals who showed us so much kindness it offset the bad apples. One afternoon we were fumbling around a village trying to find some information about a yodeling concert that was supposed to be that night. We got a lot of weird looks until a nice young man yelled across the road and asked if we needed help. He and his friends invited us to have a beer with them in the yard and we chatted about our trip and their lives in Switzerland. It was funny to hear them mildly complaining about their government in a seemingly perfect country with no litter, where everyone dives either a bicycle or a brand new car. We thanked them for their hospitality and ended up skipping the yodeling concert because the crowd was dressed in suits and ties. We pressed on and found camping for the night at the nicest (and most expensive) campgrounds we had ever seen. Things continued this way as we made our way south towards Murren. At one point, my poor route planning left us on a trail we thought was for bikes but it ended up being a challenging hiking path. It turned out to be a pilgrimage path with stations of the cross every few hundred meters. The terrain was steep and at one point as Lauren was struggling to lift her bike up onto a ledge on the path, a kind old woman in her 70’s appeared out of nowhere and started giving her a push. It was a hilarious scene and we laughed as we thanked her profusely in broken German. A few minutes later the path turned rough again and another even older gentleman came by and did the same. Towards the top of the path, we found a ledger for those making the pilgrimage and signed our names with pride. We made it over pass after pass and continued on, subsiding on Baguette, Salami, Rugen Brau beer and swiss mountain cheese. If it hasn’t become apparent yet, Switzerland is really expensive and our budget was stretched pretty thin. Never did see the bird, but apparently this is good luck. We finally arrived in Interlaken which is a beautiful city placed between two gorgeous lakes… Get it? Interlaken? They also had the only other incline train I’d ever seen outside of Pittsburgh. We were lucky enough to have a response on warmshowers and our host Matthius was very kind. We waited for him in the park drinking wine and watching paragliders landing. He met us at a cycling cafe after work and rode with us to his village a few miles away. We were treated to a much needed shower and some lovely meats and cheeses. The later of which was from his family’s cow! We shared stories of traveling and looked at maps of the world together talking about the places we’ve lived, visited and wanted to see. At the end of the night, he brought out a book with his villiage’s history dating back to the middle ages. It was complete with family sigils and drawings of the old farming methods used in the mountains. He explained his families sigil to us and pointed out that the star in the corner meant that someone in the family had been a knight. He said the remnants of the castle on the nearby hill were still standing. It was an amazing evening and reinforced that the best part of traveling is interacting with the local people. We forgot to get a picture together but we did get a few in his awesome hundred year old house. Somehow we always manage to match… Nerds! We left Interlaken and still had a day to kill before Lauren’s family arrived in Murren. We rode through a beautiful valley to Lauderbrunnen where we froze huddled under a bike parking area outside of a convenience store for a few hours. We debated riding up the mountain in the sleet but instead stopped at a bar which happened to have a hotel upstairs. The next day, we elected to take a cable car instead of climbing the mountain in the freezing rain. We arrived in Murren and while it was incredibly touristy, we enjoyed riding through the streets on our way towards our lovely camping spot. We set up shop in a shack on the side of the road and slept soundly although a bit cold. The next day, we killed time drinking beer and wine on a bench and playing gin rummy waiting for her family’s train to arrive. When they did, we upgraded from a pathside shack with three walls to a beautiful Swiss Chalet for 7 days. It was a welcome change to have hot water and warm food. We spent the week with Lauren’s family checking out the local tourist attractions and playing Settlers of Catan and other board games at night. I tried going mountain biking one afternoon, but the trail was downhill Redbull style so I ended up walking down most of it. We ate well and had good company although the time was too short. Before we knew it, they were off on their way back to America and we were heading south for Warmer Climes and all the Wines in Italy!